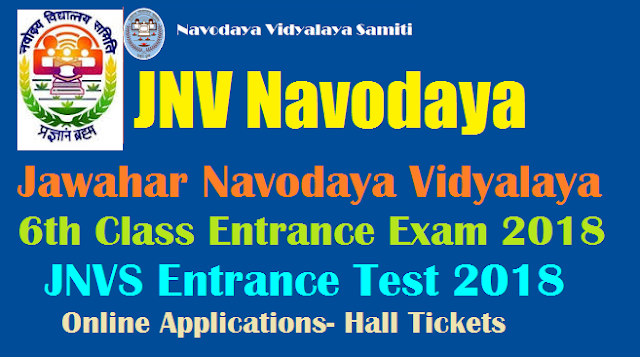 Jawahar Navodaya Vidyalaya Entrance Exam 2018 Jawahar Navodaya Vidyalaya Entrance Exam 2018,Jawahar Navodaya Vidyalaya Entrance Exam 2018 Class 6th, JNVST 2018-19 Navodaya Vidyalaya Class 6th Admission Form, JNVST Admissions 2018 Entrance Application 6th/ VIth Navodaya,JNV Selection Test 2017-18 - NVS Class VI Admission 2017 6th class jnv selection test 2018 schedule ,jnv selection test 2018 exam date,last date for apply jnvs entrance test 2018,navodaya entrance test 2018 results,hall tickets Navodaya Entrance Exam 2018 Notification for admission into navodaya schools Navodaya Entrance Exam 2018/ JNVS Entrance Test 2018/JNVS Selection Test 2018: #JNV Selection Test 2018 Schedule tp be released for conducting the 6th class entrance exam across the country in all the States for 6th Class Admissions in JNVs. So, Navodaya Entrance Test 2018 notification would be released in the month of May in every year for admission into Class VI in Navodaya Vidyalayas for 2018-2019. JNV Selection Test 2018 details, eligibility, application form, schedule, important dates, how to apply, how to fill the application form, Entrance Exam date, Last date for apply, Results/Selected Candidates list and more details are provided here. Navodaya Entrance Exam 2018 Notification: Navodaya Vidyalaya Samiti, Ministry of Human Resource Development, Department of School Education and Literacy Officials would sent the "Time Activity Schedule for Conduct of JNV Selection Test 2018 for Class VI" to all the Deputy Commissioners of NVS Regional Offices and All the Principals of Jawahar Navodaya Vidyalayas. In this connection officials are requested to follow the Time Activity Schedule for conduct of JNV Selection Test 2018 for admission of students to Class VI in Navodaya Vidyalayas for the academic year 2018-2019. In this regarding Officials has also sent to Prospectus and Application Form for conduct of JNV Selection Test 2018 for Class VI. Jawahar Navodaya Vidyalaya Samiti Entrance Notification 2018 announced as per schedule in each district of all States of India. This notification was announced through press media by the NVS Regional Officials. NVS Officials will invite the applications from eligible candidates for admission into class VI for academic year 2018-19. Jawahar Navodaya Vidyalaya Selection Test - 2018 JNV Selection Test for admission to Class-VI in JNVs for the academic session 2018-19 will be held as per following schedule. The last date for uploading online application in the office of Common Service Centre is 25th November 2017.
i. On Saturday, the 10th February, 2018 at 11.30 A.M. in the State of Andhra Pradesh, Assam, Arunachal Pradesh (except Dibang Valley & Tawang Districts),Bihar, Chhattisgarh, Goa, Gujarat, Haryana, Himachal Pradesh (except Chamba,Kinnaur, Mandi, Sirmour, Kullu, Lahaul & Spiti and Shimla Districts), Jharkhand, Kerala, Karnataka, Madhya Pradesh, Maharashtra, Manipur, Orissa, Punjab, Rajasthan, Tripura, Telangana, Uttar Pradesh, & West Bengal (except Darjeeling), Union Territories of Andaman & Nicobar Islands, Chandigarh, Dadar & Nagar Haveli, Daman & Diu, Delhi, Lakshadweep and Pudducherry. (iii) To promote national integration through migration of students from Hindi to non­ Hindi speaking State and vice­versa. The application for JNV Selection Test 2018 is being processed through Common Service Centre of Ministry of IT, Govt. of India. Common Service Centre has a wider range with 2.6 lac centres across the country virtually covering every village. As per the MOU with NVS, Common Service Centre will be charging Rs 35/-(Rupees thirty five only) to be paid by the parent/ candidate towards service charge to upload the application form per candidate. 6. Candidates belonging to the Scheduled Castes (SCs) and Scheduled Tribes (STs) will have to produce a certificate of the Caste/Tribe at the time of seeking admission, if selected. Such certificate should be procured from the competent authority before 15th July, of the year of seeking admission so that it may be submitted to the Principal of concerned JNV at the time of admission. 3. A candidate appearing for the selection test must be studying in Class-V for the whole of the academic session 2017-18 in a Government/Government aided or other recognized schools or ‘B’ certificate competency course of National Institute of Open Schooling in the same district where he/she is seeking admission. A school will be deemed recognized if it is declared so by the Government or by any other agency authorized on behalf of Government. The Schools receiving financial assistance under Sarva Shiksha Abhiyan should be sponsored by Govt. or Govt. authorized agencies. Schools where students have obtained ‘B’ certificate under National Institute of Open Schooling should have accreditation of NIOS. A candidate must successfully complete Class-V in the session 2016-17. Actual admission in Class-VI for the session 2018-19 will be subject to this condition. 5. Candidates who will be passing ‘B’ certificate competency course of National Institute of Open Schooling on or before 30th September, 2016 are also eligible to write admission test provided they are in the prescribed age group. The forms of such candidates will be verified by DEO/DIOS. The rural status of a child from National Institute of Open Schooling will be decided on the basis of a certificate to be issued by Tehsildar/District Magistrate of the District indicating that the child has been residing in rural areas for the last three years. Students studying under the above scheme from urban and notified areas are not eligible for obtaining seat in rural quota. 6. A Candidate who has not been promoted and admitted to Class-V before 30th September, 2015 is not eligible to apply. 5. The last date of submission of online Application Form in the office of Common Service Centre is 20th November 2017 for test to be conducted on 7th January, 2018 (Summer Bound J NVs) as well as test to be conducted on 8th April 2018 (Winter Bound JNVs) & 9th J une, 2018 (Extreme Winter Bound JNVs. Last date for submission of Application : 25-11-2017. ⇛No change in the answer once written is allowed. ⇛Overwriting, cutting and erasing on the Answer Sheet is also not allowed. ⇛One mark will be given for every correct answer. ⇛No negative marking will be done.